Earlier this fall, we found an incredible amount of success within the shipping sector, as an industry-wide wave of bullish activity carried many related stocks to record moves. That rush tuckered out a few weeks back, but we want to circle back around this morning to cast a light on several of these stocks that we think could be gearing up for a recovery. Each of the following had been in a drastic downturn leading into yesterday’s session, and each of them began to show some major signs of life in coming off their bottoms. We’ll want to keep all of them in mind in coming sessions, and watch for signs that a more sustained uptrend could take effect. We stipulated yesterday that if CBIO held above .80 on any early pullbacks, that we’d be interested in tracking its activity through the session, and it did just that. The intraday machinations of the stock actually provided two separate opportunties for swing trades. First, the initial run out of the gate that took it from 1.12-1.42 (+27%) and a subsequent dip-and-rip pattern from .855 back to 1.12 later on in the day (+31%). With volatility sufficient to provide over 50% in cumulative gains on the day, and the fact that it maintained support above our designated level, we’ll keep CBIO on our radar for the time being. On strong 2017 guidance released this week, LLY beat Wall Street’s forecast outlook estimates for the first time in 3 years. As a result, the stock started to climb, and has begun to fill a large gap on the chart to the upside. What we want to do here is highlight both a short term and extended term options trading idea to correspond with the present situation. For swing trades this week, we’ll look at the LLY Weekly $72 and $72.50 Calls, and to take advantage of the possibility of an extended uptrend, the LLY 01/20 $75 Calls. Interpace Diagnostics Group, Inc. IDXG - We outlined IDXG in Thursday morning’s report, and after witnessing a low of .3619 followed by an excellent 232% pop to 1.20 on that first day, we were optimistic about our chances for seeing more new highs on Friday. 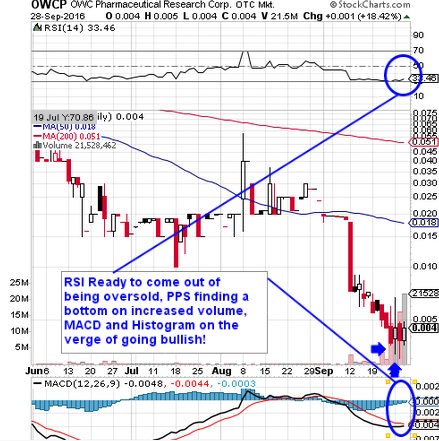 After initially alerting this stock on Wednesday at a low of .85, MJPI is another multi-dayrunner that we were tracking into the latter half of last week that ended up setting new highs on Friday. The stock traded in a range from 1.38 and went as high as 2.02; a 46% intraday push. The new top mark, from our observed low of .85, represented an overall increase of 138% in a span of just three sessions. OPHT is setting off our bottom alarms in a big way this morning. The stock is getting absolutely massacred in the premarket in the wake of a poor clinical data release today. The stock is falling to record lows, which is always something that causes us to take note. Whenever a knee-jerk reaction to any news sends a stock barreling down to its lowest prices ever, you can be all but certain that at some point in the near future, there’s going to be a substantial rebound. With that comes bounceplay opportunities- a chance to properly time the eventual recovery for what could be significant gains. That’s why we’re placing OPHT on intensive bottom watch in coming sessions. We began talking about CNBX earlier this month, mentioning it on the 5th and 6th, as part of our ongoing effort to remind our readers of the myriad opportunities there are, and will continue to be, in the cannabis space. We’re now less than two weeks away from an election that should dramatically alter the landscape of the marijuana business. CNBX is among a number of pot-related plays that we’ve had on our running tracklist, and with the help of a really strong month overall, it has come all the way from our observed low of .06 on the day of our initial mention (10/05) to a new high yesterday of .377. That works out to an increase of 528% inside of three weeks. It wasn’t the first time we’ve seen such a huge move out of a cannabis stock, and it certainly won’t be the last. Speaking of the cannabis sector, MYDX is another constituent of that space that we’ve been tracking this month only to witness some excellent moves to the upside. We entered MYDX into the mix on the 10th, and subsequently observed a low of .0225. Since then it’s been a fairly steady ramp-up and yesterday the stock achieved a new high of .0525. It represents a total PPS rise of 133%, which, like the above-mentioned play, occurred in a span of less than three weeks. We’re going to close things out for the week with the following options ideas. *Don’t forget what we always say regarding the trading of weekly options on a Friday. Advanced traders ONLY! On an otherwise slow day, we were able to see a nice intraday move out of NGBL after including it in yesterday morning’s premarket watchlist. The stock tapered back to close at .0011, so it didn’t manage to hold at least half of its daily advance, but we’ll still remain interested in monitoring its activity provided it can hold support at or above yesterday’s swing-low on any pullbacks. We also want to circle back to ORRP for an update this morning, following yet another solid intraday performance from the stock. We signaled this play for observation on both Monday and Tuesday, observing an overall low of .265. The stock has made higher highs and higher lows each day since, and yesterday it ran from a morning low of .355 to a new high of .50, a 41% pop. From our initial low we witnessed at the beginning of the week, we’ve now seen ORRP make a total increase of 89% We’ll continue to have it on watch for the possibility of a sustained uptrend. 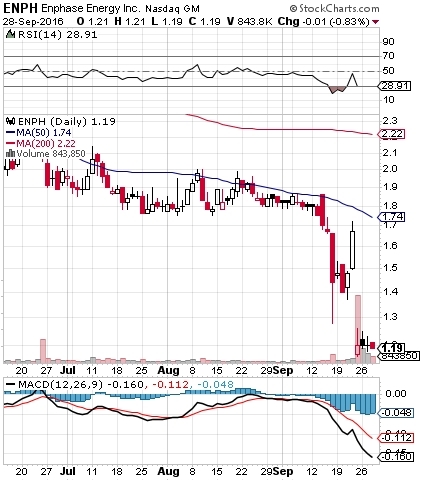 We want to place ENPH on bottom-watch this morning after the events of the past few days have seen the stock coming off of a newly-recorded 52-week low. There was a major selloff that resulted in a large gap on the chart, as you can see on the snapshot below, which was catalyzed by the company’s recent 13 million-share public offering. Since then the stock has been hovering around the level where the offering was transacted (1.20), but we’re going to want to keep it on watch for a recovery. There has also been some recent insider buying in the stock, something for which we’re always on the lookout. All these factors, coupled with an oversold stock, make ENPH one that we’re going to be watching carefully in coming sessions. We’ve got another possible subpenny bottom-play hitting the scanner this morning in OWCP. We’ve pointed out the various signals on the chart below, and will be monitoring the situation as we head into week’s end. Regaining even half of its PPS levels of less than a month ago, would mean gains of at least 150% from the current share price. The first thing we want to mention this morning is the performance our running options idea for PLCE that we formulated earlier in the week. We continued to stay on the trail of PLCE Weekly $70-75 Calls in yesterday’s premarket report, even after they had provided us with chances at gains ranging from 112-315% in the prior session. Despite the $75′s being a bit too far out of the money for any notable action, the other two contracts from within our target sets performed solidly once again. The $70 Calls traded in a daily range from 2.85-3.70, which marked an intraday rise of 30% The $72.50′s fared even better, running from a low of .65 to a high of 1.30, marking an even 100% rip and the second consecutive session wherein the stock provided the opportunity at at least a double-bagger. We tagged IMMU for observation on Friday of last week, and since that time the stock has made an appreciable swing to the upside. Our observed low on the stock is 3.59, which gave way to a new high of 4.25 yesterday. That represents a modest yet notable 18% increase. We’ll want to continue to monitor the activity in this play which will hold our interest moving forward, provided it can maintain support at or above its previous resistance point of 4.00 on any pullbacks. GEQU has proven to be a solid winner for us in the past. We recently re-tagged it at a perfect time on 11th of this month, just as it was coming off a bottom. We saw the stock trading as low as .0123 yesterday it closed at a new high of .03, which goes down as a 144% swing. We’ll keep our eyes on this one as well, in the event it can maintain support above the 200DMA of .0235.